Rahul Dravid is a mobile coaching clinic. You just have to watch and imbibe his technique. I think Rahul Dravid is one of the finest we have. I am very impressed with Rahul's technique and temperament. Dravid has been a class player for a long time now and we know his ability better than anyone. Averaging 21/2 hours at the crease against us is a fair stat. He's not like the other guys who love scoring off every ball, and there's no real weakness in his game either. He's mentally strong. You've just got to bowl well to him early on because he gets himself really set for a big innings once he is in. 'The Wall' (Dravid) is a solid player with very good technique. He's a champion at everything. I really admire him. I am very impressed with the way he approaches life. He brings a serenity to the crease that is so good for the nerves in the dressing-room. He also helps ease the tension away by the way he plays. He then proceeds to make the fastest of bowlers look easy to bat against. His economy of movement and the preciseness of his footwork gets him into position quickly, and so, the bowlers look quite clueless. The fastest of deliveries is played as if it's done every day and with minimum fuss. He is one of the guys who works extra time over his fitness levels and look at his scores this season. Sourav and I have been really lucky that Rahul (Dravid) has been tremendously loyal to both of us. Rahul is as good as anyone in the world. I have also not seen him lose his temper. He has that uncanny skill of keeping his frustrations to himself. He hates to get out though and you can see the restlessness in him till he gets his act together in the next outing. He is the most hard-working guy in the side. I learn from and admire his consistency. We have been together for four-five years and it is a great learning process to bat with him. It definitely helps when I bat alongside Rahul, a guy who is so intense and is concentrating at all times kind of inspires you at the other end. Rahul is always hard to bowl to, as he is technically very sound. He is an attacking player once he gets his eye in. He also has the ability to stay long, which the team experienced during the Test match in Calcutta." We always knew he was a good player but now we're going to have come up with a new plan to get him out. He's a pretty good role model for kids. He's pretty steady in what he does and he does things the right way, and he's very dedicated. He has a great technique and a great temperament. He (Dravid) batted like God here once again so I'm not surprised the way he's played. Rahul is of the thinking sort. His strengths are his resilience and tremendous ability to grasp things. I respect Dravid a lot. He is a great player and my favourite too. I don't think any other Indian batsman is as difficult to bowl to. He has got the class. He is very stable and balanced - necessary characteristics to be able to play like he does. Rahul was never in doubt about his priorities, and cricket was always first. He was keen, and had a burning desire to succeed, and was always focused. He was playing with determination, and it was obvious that he wanted to reach a goal. So one never had to push Rahul Dravid. He is a sensible cricketer with a calm presence. I think he can do a good job with captaincy. Even though Sachin is great, I have always found Rahul more solid and hard to get out. He has a solid defense and plays less shots than others. When a batsman plays less shots then it is tough to get him as he makes less mistakes. Rahul reminds me so much of Dilip, Sunil (Gavaskar) and that team which performed so consistently. He is a wonderfully reliable player. 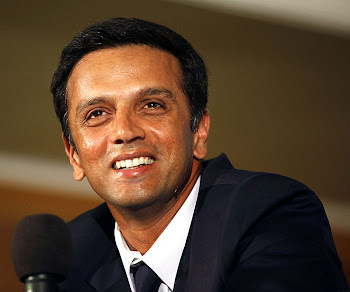 To have transformed himself into a world-beater speaks a lot about Dravid as a person. It does not get better than what Rahul Dravid did in this Test. His batting was outstanding. Everyone has already exhausted superlatives so I would not bother myself with any additional praise but you could be sure my admiration for him has grown tremendously. I m die hard fan of RAHUL DRAVID. I WISH HIM "ALL THE SUCCESS"